FWC is planning on doing a second round of burning on Lake Istokpoga sometime next week. They will be burning the NE marsh of Bumble Bee Island (red polygon). This is actually a continuation of the burning done a month ago. Some additional drying has occurred and the fall out is ready for burning. 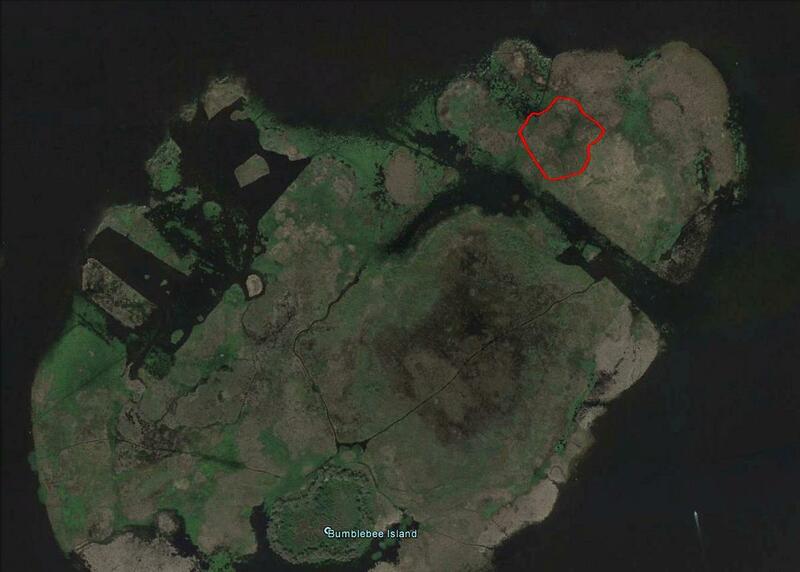 We have attached the file depicting the location of the burn. We are waiting to get a West, NW, North, NE or an East wind for this project. 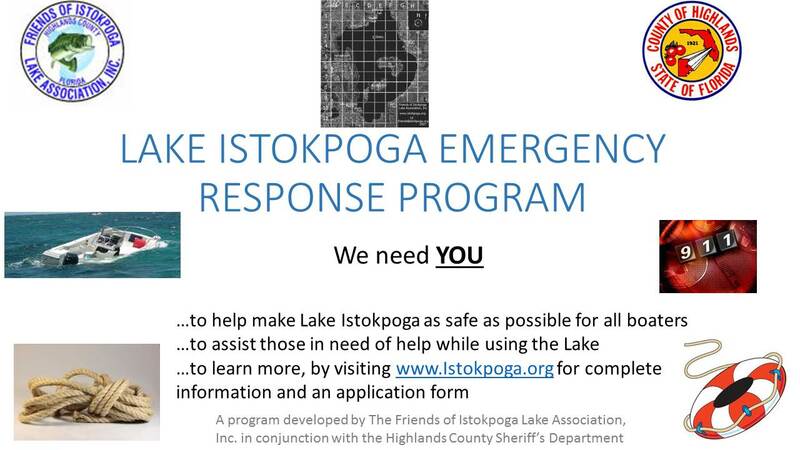 The Friends of Istokpoga have begun accepting volunteers for the Lake Istokpoga Emergency Response Program. So far we have nine volunteers, but we need many more before we can tell Highlands County we are ready to officially begin this program. We are especially in need of volunteers all along the western shoreline, Hendersons Cove area including Elliots, and the South end of the lake. If you are interested please download a copy of our Volunteer Form and send it in to us. If you have any questions regarding the program please send us an email at friends@istokpoga.org . The Friends of Istokpoga newsletter, The Istokpoga Newswire, for September 2013, will be in the mail shortly to those that receive it via the U.S. Mail. It is available today to our members in the Members Only section of this website. Be sure to check it out. WC presented their plans for Aquadic weed control this week. There are no large scale plans for hydrilla treatment this fall, and there are currently none for the spring. FWC will, however we look at the hydrilla situation early in 2014. There are plans for other aquadic weed control on the lake. Please see the below files for details of where they will be working. Work for the herbicide work in 2013 will be September 14-16, and the harvester work will begin in October 2013. This spring the hydrilla has not come on as expected and some areas that were left after the fall treatment have been knocked back by coots, winter weather, and fall treatment drift. The 500-600 acre area west of Arbuckle at the north end as of now will not be treated this spring. This area has actually reduced in hydrilla biomass since November. We are planning now to continue to monitor for treatment later in the season if needed. This leaves only the trail through the center of big island scheduled for this spring. This treatment is targeting not only hydrilla, but water lotus and spatterdock that all get very thick during summer months and choke off navigation in this area. Steve did some harvesting work in this area last year to remove some of the extensive tussock material in the area. This spring herbicide treatment is a follow-up to that, and intended to not only open navigation up in the main trail area, but also increase water flow through the area, decrease stagnation, and increase light to better support native submersed plants like ellgrass to expand in the area. There are some areas of hydrilla along the western shore and south end around windy point area that I am watching now as the water continues to warm. These areas are just starting to come on with hydrilla and may need spot treatment by airboat in the next few months. We are also considering cutting some openings in the spatterdock along the western shore where it is very dense and thick. This would allow better fishing access as well as sheltered areas on windy days, and remove the heavy spatterdock from areas where native grasses like maidencane and knotgrass are established in small patches, and allow these beneficial native grasses better opportunity to expand into deeper water. We are all set for our 3rd annual bass tournament which will be held on December 1, 2012. The tournament will kick off at first safe light on the morning of December 1st. For all the rules, and registration form you can visit fish camps and bait stores around Lake Istokpoga or download them from this website. To view or download the poster click here, and to view or download the rules and entry form click here. At a public meeting on October 30th FWC presented the plan for the fall and spring hydrilla treatments for lake Istokpoga. Click here to read the meeting summary and Click here to see the treatment map. We recently announced our new Lake Istokpoga Grid map and have made it available free to anyone that wants it. Our intent is to give you a tool to help make boating on Lake Istokpoga safer for you and your family members. You can download and/or print it from our website for FREE. We also are making available laminated versions of the map for a donation of $3.00 each to anyone who wants them. The Friends of Istokpoga Grid Map is 8 ½ by 11 and on the front it has a full page map of Istokpoga. This is a satellite image of Lake Istokpoga. It has a grid overlaying the lake so you can locate yourself on the lake if you need to. This could be very important if you have an emergency and need help. The map also contains GPS locations for some key landmarks, like canals, boat ramps and fish camps. The back side of the map contains important grid locations and phone numbers for emergency numbers and fish camps. Take a look at the map on our website and see what you think. Download it if you like it and order a laminated copy for your boat. If you like it, tell all your fishing buddies so they can get one too. Be sure to include you complete mailing address so we can mail you your map (s). Friends of Istokpoga Lake Association with the help of Highlands County has developed a Grid Map of Lake Istokpoga and has made it available for printing and/or downloading on this website. For more information go to Grid Map. You can also get a laminated copy at our upcoming meeting on 17 May 2012 and and our future meetings for a donation of $3.00. This quarterly edition of the Istokpoga Newswire is now available for viewing or downloading in our Members Only Section of this website. The hard copy version will be in the mail shortly. If you are not a member of the Friends of Istokpoga Lake Association you can join by printing out a membership application and sending in only $7.00 annual dues. Or, you can join us at our May 17th meeting in Lorida. As a member you will receive the password to our members area. If you want to see some of our older editions of the Istokpoga Newswire you can see them in our public area. The hydrilla treatment will be delayed until the week of February 20-24 because of scheduling issues with the helicopter. Florida Fish and wildlife Conservation Commission Invasive Plant Management Section will be conducting a helicopter treatment application. to treat 4028 acres of hydrilla and 100 acres of navigational trails on February 13th and 14th 2012. See Map of planned treatment areas. The February issue is now available in the Members Only section. We have posted the Hydrilla Management Plan for Lake Istokpoga 2011-2012 by Ericka Van Horn from FWC. FWC has released a new hydrilla treatment map and revised the treatment dates to November 29 and 30. This treatment will focus on the ~1800 acres in the littoral zones (shoreline) so it will not need to be treated during the bass spawn in the spring. There will be a second treatment in February of ~4000 acres. this second treatment should not effect the spawning areas. The work on the Lake Istokpoga Residential Canal Project has been completed. You can read a review of the project written by Clell Ford, Highlands County lakes Manager, in the latest edition of the Istokpoga Newswire, mailed recently to our members and available in the Members Only section of this website. A few pictures are available on the Canal Project page. If you have pictures of the work on your canal you would like to share that shows other interesting views of the work and you wish to share them, please send them to friends@istokpoga.org with a note stating that you are the owner of the pictures and that you give permission for the Friends of Istokpoga Lake Association to use them. FOI Family Fun Day on the Lake (26 October 2011) Attention Crappie Fishermen!! Mark your calendars for Saturday, December 3rd. You have an opportunity to help our lake by participating in a Tagging Survey being conducted by the Florida Fish and Wildlife Conservation Commission (FWC) on Lake Istokpoga. Bill Pouder, FWC, will be at our November 17th FOI meeting to give all the details and our November Newsletter provides some details. Basically, we are holding a Fun Day of fishing for Crappie (specks) where you catch them and FWC Biologist will tag and release them on Saturday morning. At noon FOI will provide a cookout for all those that participate. Come to our November 17th General Meeting for full details. The Second Annual Friends of Istokpoga Bass Tournament will be held on Saturday, November 19th. Please see One Day Tournament for a description of the tournament, and see Tournament Rules for the specific rules governing this tournament. At the Hydrilla Planning meeting held today the FWC plans for the treatment of hydrilla on Lake Istokpoga were shared. Briefly, about 1800 acres will be treated between November 29th and December 9th of this year. A second treatment of about 4000 acres will occur February 13-14th 2012. This second treatment will avoid the bass spawning areas. There has been a problem with accessing the members only area of the website which has now been resolved. We are sorry if this caused any inconvenience. There was also a problem accessing the May Newsletter which has also been resolved. FWC Aquatic Plant Control plans to cut some trails through some areas of hydrilla on 30 August 2011. A map of the areas to be treated is available. New maps of the canals that are still not completed are now available: West Side, Mossy Cove, Henderson's Point, Elliott Road, and Istokpoga Shores. Here is the current order in which the contractor expects to be working on residential canals in Lake Istokpoga. This order will be followed in general, though conditions in the field may necessitate changes. For that reason, there are no dates associated with this work schedule; we anticipate being able to give canal residents at least one week advanced notice as to when work will be done in their canals. Canals 116 and 117 – complete as of 5/19/11! After Istokpoga Shores, the contractor will either move up to the Elliot Road - Bald Cypress area, or will start work on the southern canals including Mossy Cove and Istokpoga Marina – that will be determined in June. All dredge work in the canals is slated to be complete in August; management of the disposal sites, including spreading and seeding of dried canal sediments will be complete in October. Last week we told you today, April 18 was the start date for work on our first canal. In a discussion with Clell Ford (Highlands County Lakes Manager and Project Manager for the canal project) this morning he indicated the contractor’s projected start date was a bit optimistic. It appears now that the target “in the water” start date will be next Monday or Tuesday at Mallard’s. The initial work on the Istokpoga Canal Project is scheduled to begin on April 18th at Mallards. By the end of May, 5 canals should be completed. These first 5 canals in Mallards, Palm Estates, and Sunset Shores, will be 116, 117, 118, 119, and 122. All of the work on these 5 "primary" canals is scheduled to be completed by May 31st. Please refer below to our news item of 21 December 2010 for aerial views of these canals and the assigned numbers. We will provide additional information on the schedule as we receive it. SFWMD today declared a water shortage. Click here for detailed report. We received some good news at the LIMC meeting on Thursday. The Canal Project work is starting soon. The contract has been approved by the Highlands Count Board of County Commissioners and is due to start soon. You can view the charts that were presented: March 15 Charts Dates for each individual canal are not available yet. Each home owner on a canal that is on the list to be cleaned will receive notification from the county and will; be invited to attend a meeting in their neighborhood that will provide detail information and a chance for questions and answers. After receiving concerns from various citizens that live on or utilize Lake Istokpoga regarding navigation, concerns were vetted through the Lake Istokpoga FFWCC Standing Team. 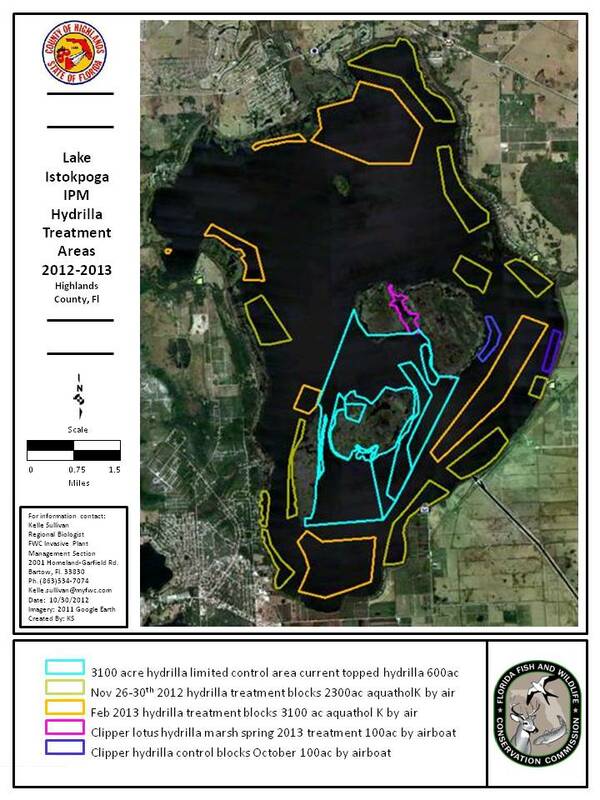 150 acres of navigational trails was added to the hydrilla treatment plan to be conducted on March 8th 2011. Navigational trails will be treated through a 250 acre block South of Bumble Bee Island totaling 45 acres of trails and a 650 acre block East of Big Island totaling 105 acres of trails, in addition to the 411 acres that will be treated on the Eastern shoreline to prevent encroachment of hydrilla onto native plant species, to minimize biomass and increase navigation. The trails will be 250 ft width and run across the hydrilla to open up access. Due to the narrow width of the trails, the contact herbicide Aquathol K will be applied at a rate of 3ppm to assure adequate treatment. I have attached a map of the Navigational trails. Hydrilla management on Lake Istokpoga continues to require an adaptive management approach due to the evolving concerns of citizens and interest groups as well as changes in unpredictable field conditions on a highly invasive exotic plant species. The patience and commitment of those involved with the Lake Istokpoga Hydrilla management and all citizens and interest groups of Lake Istokpoga is greatly appreciated. If you need further information or would like to discuss the treatment plans, Please, contact me. Thanks to Erin McCarta we now have the canal list for the primary canals and the secondary canals. In case you have not heard the latest, the original 17 canals have been whittled down to 14 canals and these are the primary canals. DEP rules for canals eliminated the 3 that were removed because they are rim canals and have different rules. DEP has also come up with a solution for some other canals. These are the secondary canals. The 14 primary canals will all be completed. The secondary canals will be done if there are sufficient funds left after the primary canals are completed. As many as possible of the secondary canals will be done. The maps of the the canals are fairly large PDF files, so viewing them could take while for them to come up. If you are using a dialup connection do not try! Click on them to view them. We have added a new page to the website. While it is today just a start, we plan to add material as it becomes available. The new page is dedicated to Endangered Birds of Lake Istokpoga. Currently there are two links to articles about the Snail Kite. You can visit the page today: Click here. The below note along with two maps were received from FWC today with changes to the planned hydrilla treatment. See Map1 and Map2 for an overview and read the explanation below. The Lake Istokpoga FWC Standing Team met today December 1st 2010 to address some of the concerns that have been expressed by various stakeholder groups interested in the management of hydrilla on Lake Istokpoga. After careful consideration by the members, it was decided to conduct a split treatment that would entail treating some areas of the hydrilla this fall followed by targeting the remainder of the hydrilla in February or March. The fall treatment proposal includes treating along littoral zones to protect native species Eel Grass and Illinois Pond weed from encroachment of hydrilla while also minimizing any impact during the bass spawning season or impact any potential Snail Kite nesting site during the spring. It will allow for a level of open water hydrilla and areas of mixed emergent species and submersed hydrilla areas to remain for water fowl that currently utilize the areas.. Areas around the S68 structure will be treated to prevent flood issues. Other areas will be targeted to improve navigation. It is still scheduled to cut navigational trails through a 200 acre block West of Mossy Cove to create the fringe effect preferable to sport and recreational fishing as planned. No new areas have been added in the treatment zones, only the timing of when treatment will be conducted in each area of the original treatment plan. The treatment date for the fall treatment is scheduled for December 6th and 7th. I have attached a map of phase one of the split treatment plan. I have also attached an over lay map showing where the treatment blocks are located in relation to native submersed. Please, note the Remetrix map was conducted in December of 2009 and though the native species are accurate, the hydrilla has expanded since the mapping date. We will schedule an Istokpoga Hydrilla Management meeting sometime in January to discuss the results of the treatment and upcoming treatment plans. I will email the details for this as soon as they are available. Please, feel free to contact me at any time to discuss the changes made. The treatment is now scheduled for December 6-10 per FWC. Beginning on December 1st FWC will be working on Big Island and Bumblebee Island. The harvester locations are identified on the attached maps. Site #1 is located at the north end of the boat trail the runs through the Big Island marsh. Site #2 is located at the south end of the boat trail the runs through the Big Island marsh. Site #3 is located on the northwest area of Bumble Bee Island marsh. Friends of Istokpoga (FOI), Outback USA and Trails End Fishing Resort will be sponsoring the "First Annual Friends of Istokpoga Bass Tournament" on November 13, 2010. The cost to FOI members is $75 per boat (two man) and for non-members the cost is $125 per boat (two man). Non-members will be given a chance to join FOI ($7.00 per man for a single membership) before submitting their registration forms (FOI Membership Application). Payback (prize money) will be 100% less the administrative costs associated with holding the tournament. The boats will launch from Istokpoga Park off US-98 beginning at safe-light (determined by the tournament director). The tournament will end promptly at 3:00 PM at the weigh-in at Trails End Fishing Resort. See Rules and Registration forms for complete details. You can register at Outback USA or Trails End Fishing Resort (full payment must accompany the registration forms. Our Tournament Director will be John Wood, Outback USA. The Friends of Istokpoga Lake Association was informed that an extension has been requested regarding the funding for the Lake Istokpoga Canal Project. According to Clell Ford, Highlands County Lakes Manager, an extension was requested until 12/2011. Clell said he was confident that he would get the requested extension and that the funding would not be lost. At this time we still have no date for when a contractor might actually begin to work on the canals. The Friends of Istokpoga Lake Association will hold its first ever Bass Fishing Tournament in November 2010. Check back often to get the details. Our plans are to hold this tournament out of Trails End Fishing Resort (One of our Associate Members) this year. If the tournament is successful we will try to hold future tournaments at other Associate Member sites in the future. Make a difference! Take the survey today. The Friends of Istokpoga will hold its 2009 Spring General Membership meeting at the Lorida community center on Thursday, May the 14, at 7:00 PM. This meeting will have Two Speakers. They will be speaking about the lake levels and the residential canal dredging. The first speaker for the evening will be Gary Ritter Manager Okeechobee Service Center from South Florida Water Management District (SFWMD). He will be giving a presentation about the lake levels and some insight into what determines when, where and why they are releasing or not releasing water from S68. He will also be able to answer some question about other functions that SFWMD handles on the lake. The second Speaker of the evening will be Mr. Clell Ford (Highland County Lakes Manager). He is going to give an update on the residential canal dredging project. He is the project manager so come prepared with your questions Mr. Ford. There will be refreshments served beginning at 6:45 PM. There will also be a membership table where you can pay your 2009 dues. Please come out and bring your friend and neighbors and other who are interested in our beautiful Lake. This will be a very informative evening with two dynamic speakers. Attached is the map for the harvesting project on Lake Istokpoga. The project will start on March 30 and end on May 28. If anyone is interested in seeing the harvesting work I will be out every Monday, Thursday and Friday while the project is running. Call to make an appointment. Click here to see map of harvesting locations. South Florida Water Management District (SFWMD) is holding a Photo Contest for amateur photographers. The winning photographs will be featured in the 2010 Lake Okeechobee Area Calendar. Normally this calendar is only for pictures of and around Lake Okeechobee, but this year it is also open to pictures around Lake Istokpoga. Entry forms and contest rules are available on the SFWMD website at www.sfwmd.gov/okee select "Info and Education when you visit this page. The next meeting of the Lake Istokpoga Management Committee (LIMC) will be Thursday, March 19th, 9:00 am until noon. The next meeting of the LIMC Management Plan subcommittee will be Thursday, March 26th, 10:00 am until Noon. We are still waiting to hear when the next meeting of the Hydrilla Sub-committee is going to be held. They have begun today and the plan is to target up to 200 acres of torpedo grass on the western, northern and eastern shorelines of Lake Istokpoga. The airboats will be out all week. To see map click here. We hope to have a map available on our website soon. We will post is as soon as possible. Highlands County Parks and Recreation Department plan to have handouts available for distribution at all the public boat ramps soon. If we receive any additional information on this or future hydrilla treatments we will post then to this message group. As announced in the September issue of the Istokpoga Newswire, the Canal Project is proceeding with the original 17 canals and possibly more. The plan is to get a total of 61 canals, but to date only 17 have been approved. The Canal Chart shows all the canals for the project, with the 17 approved ones with the large bullets and the rest with small bullets. The estimate given at the last LIMC meeting was to complete the initial canals within 6 to 9 months. The fall herbicide treatment areas that FWC intends to do this month and next is available for viewing: (warning - File is 2 mb) Fall Treatment. The FWC and SFWMD are planting 800 pond apple trees on the northwestern side of big Island on Lake Istokpoga starting at 8:00 am on Tuesday and Wednesday July 22 &23 of this week. Please call me if you have questions. According to Clell Ford the funding request has been approved. We will continue to provide updates when they become available. No word yet on the budget for this project being approved by Governor Crist. We will keep you posted on this item as we learn anything. In the next few days we will be adding a list of the canals in plan for this project and will also list the 17 canals that have already been approved. A detailed chart and description is available in the Members Section. According to Clell Ford, Highlands County Lakes Manager, the funding will be available to dredge out many of the residential canals on Lake Istokpoga, if the Florida State budget gets approved, $800,000 would be allocated for this project. The budget is currently being reviewed by Governor Christ. At the Friends of Istokpoga meeting last Thursday, Clell was optimistic about the project. 17 of 61 canals are already approved (pending funding approval). The remaining canals require sediment samples to be taken before approval will be given. Clell said that these samples would be done as soon as possible after the funding became available. We will provide information on all the canals selected for dredging, as soon as it is made available to us, on this website. West Palm Beach, FL – Modifications to the South Florida Water Management District’s (SFWMD) emergency water restrictions will become effective Friday, April 18, when most of the agency's 16-county region transitions from one-day-week residential landscape irrigation restrictions to up to two-day-a-week watering. Call 1-800-662-8876, or see Frequently Asked Questions (FAQs). The District's nine-member Governing Board last week adopted a "Modified Phase II Severe Water Shortage Order" based on improved regional water resource conditions. Under the District's emergency authority, decisions to implement and modify water shortage restrictions are resource-based. The new schedule for landscape watering will continue conserving water supplies as part of the District's response to the regional rainfall deficit. Landscape irrigation accounts for up to half of all household water consumption in Florida. The District implemented one-day-a-week restrictions region-wide in January for the first time in the agency's history, based on extreme water shortage conditions and a continued rainfall deficit of close to 25 inches. SFWMD Governing Board Chairman Eric Buermann said last week, "It's important to note that we are not lifting emergency restrictions. Our decision to modify the restrictions is based on the improved conditions of our water resources." Although the revised landscape irrigation restrictions go into effect April 18, the SFWMD is encouraging local governments to refrain from enforcement until Thursday, May 1. The goal is to provide residents with sufficient time to become aware of the changes and adjust timers or other components of their residential irrigation systems. The modified mandatory restrictions apply to all water from traditional sources, including water from public utilities, private wells, canals, ponds and lakes. · Odd street addresses may irrigate lawns and landscapes on Wednesdays and Saturdays from 12 a.m. to 10 a.m. and/or 4 p.m. to 11:59 p.m.
· Even street addresses may irrigate lawns and landscapes on Thursdays and Sundays from 12 a.m. to 10 a.m. and/or 4 p.m. to 11:59 p.m.
Landscape irrigation using 100-percent reclaimed water is allowed any day except Friday, from 12 a.m. to 10 a.m. and/or from 4 p.m. to 11:59 p.m. Golf courses must reduce their allocated water use by 30 percent. · Residents of Orange and Osceola counties should adhere to any water restrictions set by the St. Johns River Water Management District. · Residents of Polk, Charlotte and Highlands counties should adhere to the water restrictions set by the Southwest Florida Water Management District. Due to continued local concerns about water resource availability, one-day-a week watering remains in place for the cities of Dania Beach, Hallandale Beach, Lake Worth and Lantana and portions of unincorporated Lee County, including the Lehigh Acres and Gateway areas. One-day-a week landscape irrigation remains in place for residents and businesses in the Lake Okeechobee Service Area, which includes portions of Glades, Hendry, Okeechobee and western Martin and Palm Beach counties. For additional information on the water shortage, irrigation restrictions or water conservation, call the SFWMD's toll-free Water Shortage Hotline at 1-800-662-8876, visit www.sfwmd.gov/conserve or contact a regional SFWMD service center. Helpful water conservation tips are available at www.savewaterfl.com. A meeting of the Lake Istokpoga Management Committee - Hydrilla Subcommittee has been scheduled for Wednesday, April 23, at 10:00. We will meet in conference room #3 of the Agri-Civic Center. 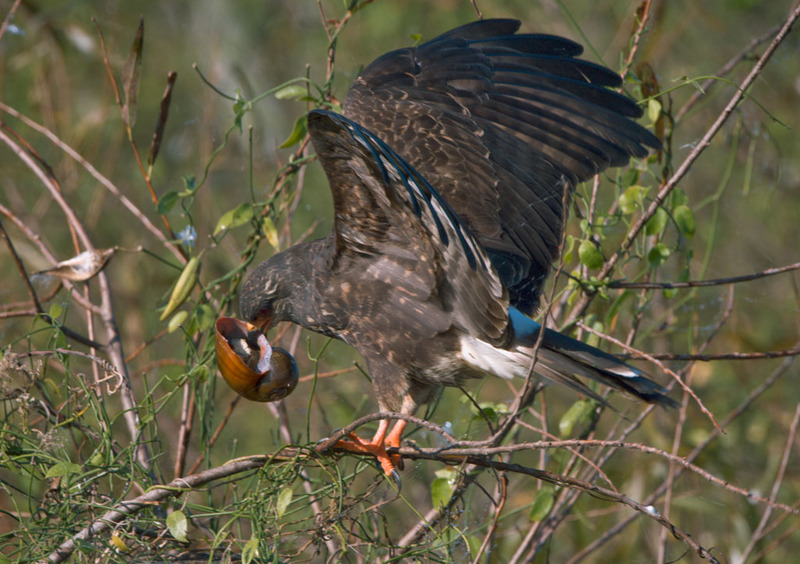 According to Florida Fish and Wildlife Conservation Commission, there are currently 11 active Snail Kite nests on Lake Istokpoga. We have just posted a draft of the Snail Kite Management Guidelines. Please note that Snail Kites are an endangered species and there for are protected. Note also that their nests are protected and no one is allowed to disturb there nests. This means not going closer than 500 feet to any nest. Currently, most of the nests are on the western shoreline of the lake, but there are also nests on Big Island and Bumblebee Island. Please read the guidelines and stay away from these nests! 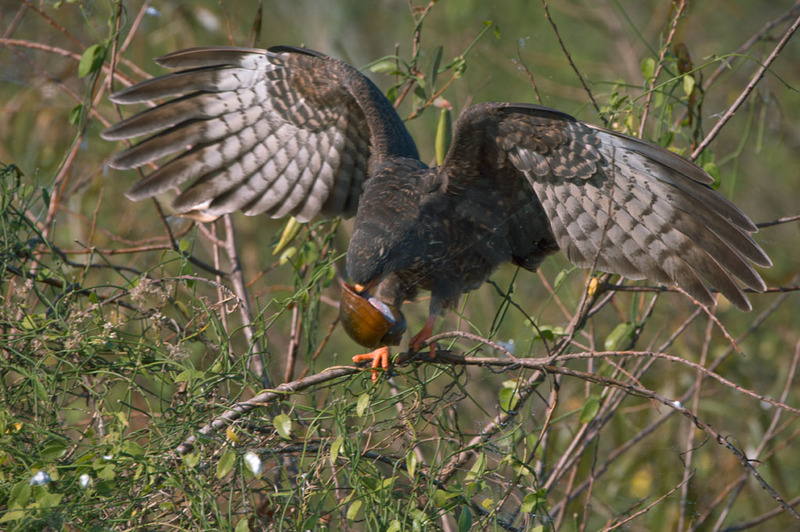 The general areas of the nests is shown in the pdf file "Lake Istokpoga Historical Snail Kite Nesting Sites"
We received a number of charts from DEP and Highlands County that show the areas planned for treatment on March 4 - 5. These charts are: istok2008treat.jpg, 2008plot1.jpg, 2008plot2&3.jpg, 2008plot4.jpg, and 2008plotcord.xls. We have just heard from DEP regarding the hydrilla treatment. It appears that we are going to target the dates of March 4-5, Tuesday and Wednesday, pending the availability of the helicopter pilot. As soon as we have revised maps showing the locations of treatments, we will send them to you for website posting and boat ramp postings for those of you who have so generously volunteered to do so. You can see the hydrilla coverage areas on our Download Page. Please note that these are very large files so do not try to download the full size pictures if you are using a dial-up connection. The Deviation Request from SFWMD was approved on January 11, 2008 by the USACE, although they did not grant the deviation to 35.5 ft. Instead they approved a deviation to 36.0 feet, per Catherine Byrd, USACE. The attached photo is a picture of the rudder on All Americans airboat that will be operating on Lake Istokpoga this month. This emblem will identify the FWC contractor from the county and DEP contractor. Also note that you will see the FWC conducting periodic surveillance that will include checking the contractor’s progress, making sure the contractor is in the right area and that the contractor is treating permitted vegetation. The Friends of Istokpoga Lake Association has partnered with Highlands County Department of Parks and Recreation to produce and install signs at the public boat ramps on Lake Istokpoga to encourage the boaters using Lake Istokpoga to clean the aquatic plants from their boats and trailers to help reduce the spread of aquatic weeds to or from other lakes. The signs have also been made available free of charge to the fish camps on Lake Istokpoga. Hopefully these will be installed soon. We believe the USACE will accept comments until about mid December. If you have comments regarding the granting of the request please write to Colonel Paul L. Grosskruger at the address in the letter. Friends of Istokpoga Lake Association, Inc has responded to this request. Please see Letter 1 and Letter 2. Highlands County, FL – A lingering water shortage and record-low water levels in Lake Istokpoga, the fifth largest lake in the State of Florida, has forced the South Florida Water Management District (SFWMD) to declare another water shortage emergency for the Upper Indian Prairie Water Use Basin. An emergency order signed this week by SFWMD Executive Director Carol Ann Wehle calls for an immediate termination of all water withdrawals directly from Lake Istokpoga or from any of the canals not separated from the lake by a structure. This order immediately affects four SFWMD water use permit holders and several dozen area residents, who depend on Lake Istokpoga for landscape irrigation. Should water levels fall below the minimum level, other permitted water users also will be affected. Drinking water supplies or water that is drawn from a well for irrigation are not affected by this order. Since the early 1960s, water levels in Lake Istokpoga have been regulated by the U.S. Army Corps of Engineers. The Corps’ regulation schedule prohibits water releases from Lake Istokpoga and canals connected to the lake when the lake’s water level declines below a critical threshold. At 38.54 feet above sea level as of this morning, the water level in Lake Istokpoga is dangerously low for this time of year and approximately 0.30 feet below this critical mark. Earlier this year, as the severity of the regional drought increased, the District requested and received a temporary deviation to Lake Istokpoga’s regulation schedule to allow releases from the lake down to a minimum stage of 36.50 feet above sea level to meet downstream demands. Successful water shortage planning efforts and effective regional water conservation measures enabled the District to avoid using the deviation. A new request to the Corps now asks for a time extension to the earlier deviation; however, because the request is pending, users whose withdrawal points are directly connected to the lake must cease water withdrawals immediately. Highlands County Code Enforcement staff will be dispatched to the area this week to identify potential violations until weather conditions change and the available water supply improves. County Administrator Carl Cool encourages residents to report violations by dialing (863) 402-6641. If the basin receives sufficient rainfall and Lake Istokpoga water levels rise above the critical area, users will be allowed to make limited withdrawals, subject to Phase III water restrictions already in place in the area. The SFWMD will publish information about which canals may be used for water withdrawals on a weekly basis each Friday – or on a daily basis should canal levels continue to drop. This information will be available via the District’s website at www.sfwmd.gov or by calling the SFWMD at (561) 682-2900 to hear a recorded message. Lake Istokpoga covers a total of 27,692 acres, but averages only four to six feet in depth. Its basin covers 607 square miles (388,480 acres). Water levels in the lake are highly dependent on rainfall and tributary inflows. Additionally, this area does not have a large reliance on groundwater because of the low yields of the area’s aquifer and its poor water quality. The below paragraph comes from the South Water Management District operational recommendation report October 2, 2007. This means that SFWMD is trying to take Lake Istokpoga even lower than it already is for the sake of downstream users. The current Lake O [Okeechobee] stage * at 9.85* today - remains in the Water Shortage Management zone and is unlikely to move back into Zone E in the next two months. The water level in Lake Istokpoga has declined to below the floor of the schedule, and the SFWMD is initiating the process of requesting a deviation from the current regulation schedule. Some of the water users in that basin have initiated requests to install *emergency supply wells* to supplement their expected demands over the next year." Treatment of Lake Istokpoga for hydrilla is scheduled to be done on April 30, and May 1, 2007. Approximately 1000 acres will be treated. A complete description of the hydrilla situation and the treatment plan is avail in a note by Erica Van Horn, "Hydrilla Treatment for 2007" and a map of the area and trails to be treated is in "Treatment Area 4-2007.pdf". The treatment will be done by helicopter. If you plan to be on the lake on April 30, we encourage you to avoid the areas to be treated. 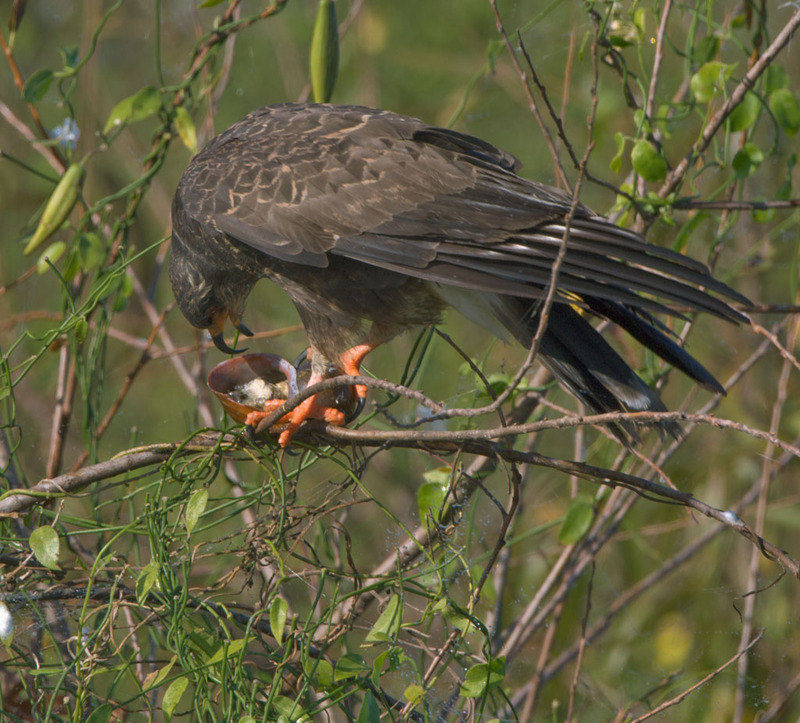 The April Snail Kite Nesting Season Update is available and Lake Istokpoga is the only lake in the central region with nesting snail kites. See Nesting Season Update and see Istokpoga Kite Zone map to see the area to avoid. Note that the area around a snail kite nest is protected. Representatives from the South Florida Water Management District will make a presentation about the drought situation and provide information on the proposed diversion plan of Istokpoga lake water. Come with your questions and concerns about this issue and any others that you have about Lake Istokpoga. Bring your friends and neighbors to this informative meeting. The Meeting will be held at the Lorida Community Center on Thursday May 17, 2007 at 7:00 PM. There will be refreshments served beginning at 6:45 PM. So come and participate in this very important issue about Lake Istokpoga. Be part of the team looking out for Istokpoga’s best interest. 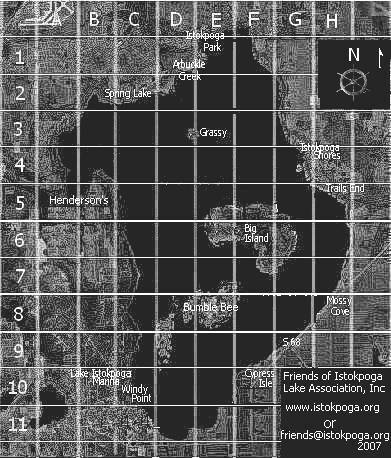 In our February 2007 issue of the Istokpoga Newswire we provided a Grid Map of Lake Istokpoga. This map provides coordinates to ease locating various points on the lake and sharing them with others. It potentially could help in locating someone that is lost. We are providing as a free file for your use. Please Note: The Friends of Istokpoga Lake Association , Inc. assumes no responsibility for the use of this map. Also note that the map is not intended to be used for navigation on Lake Istokpoga. We need you! We have lost two directors this year and need volunteers to help us on the Board of Directors. If you love Lake Istokpoga and can spare a couple of hours a month to help protect it, then we want to hear from you. If this isn't you, maybe you know someone that fits this description, then we want to hear from you too. The South Florida Water Management District (SFWMD) has requested a deviation in the Regulation schedule from the U.S. Army Corps of Engineers (USACE) for Lake Istokpoga beginning 1 April 2007. At this time the request has not been approved. Briefly the SFWMD has requested it be allowed to lower Lake Istokpoga an additional one and one-half feet because of the water shortage in the Indian Prairie Basin and the Seminole Reservation. The lake would not be dropped all at once, but would be gradually lowered over a period of several weeks. You can view the document by clicking on Temp Deviation Lake Istokpoga.pdf. We will post more information as it becomes available, so check back often. The South West Florida Water Management District (SWFWMD) has declared a water shortage for their district (on 9 January 2007). Part of Highlands County falls within this district. But, Highlands County has passed an ordinance (#05-06-42) which states that all of Highlands County will follow the water management district with the most strict rules for managing the water. In this case that is the SWFWMD. DEP has announced it will treat approximately 1000 acres of hydrilla in the southeast part of the lake in the next couple of weeks. They will be focusing on the topped out areas that are healthy. Some areas of the hydrilla appears to be dying on its own and these areas are not going to be treated. More information on the plan will be in our May Newsletter. We have implemented a Members Only Area of this website. In this section we will provide information and special stuff that will be available only to members of the Friends of Istokpoga Lake Association. Currently we have put downloadable copies of our most recent editions of the Istokpoga Newswire. This will be an added benefit for those that do not spend the entire year at on address. Now they will be able to download the newsletters where ever they happen to be. This area of the website is password protected, and the password will be changed each year. We will have the passwords available to our members who attend the fall FOI meeting on November 16th. We are still working on a method for wider distribution. You may also note a new menu item "BOD". This is another new area and is available only to the FOI Board of Directors. South Florida Water Management district declares Emergency Water Shortage in Northern Indian Prairie Water Usage basin. See SFWMD Document. The friends of Istokpoga will hold our fall general membership meeting at the Lorida community center on Thursday, November the 16 at 700: PM. We will have two speakers who will bring you up to date on some of the programs that are happening on Istokpoga. We will also have representatives of the various local and state agencies to answer your questions and concerns about the lake. Please bring your friends and neighbors to this informative meeting. Also have them fill out our membership form (in your October Newswire). We need their help in our effort to keep Istokpoga the "Jewel of Highlands County". Remember we as a large group create a large voice for Istokpoga that can be heard in our County and the State governments. There will also be refreshments served beginning at 6:45 PM. You will be able to pay your 2007 membership dues. So come out with your neighbors and participate in our effort to make Istokpoga the true Jewel that it deserves to be. See you Nov. 16. The Friends of Istokpoga Lake Association, Inc. announces the establishment of a community message group on Yahoo.com. This message group is provided so those interested in what is happening around Lake Istokpoga can communicate with others involved with the lake and get information. One of the main benefits of this message group is to help dispel rumors that come up from time to time. To join this free message group go to our Message Group page. The annual meeting of the Friends of Istokpoga Lake Association, Inc. will be held on February 16, 2006 at the Lorida Community Center. The meeting will begin at 7:00 pm. Refreshments will be served beginning at 6:45 pm. Be sure to put this one on your calendar. "While the supply lasts" or "For a limited time" new or renewed 3 year memberships are eligible to pick up a free t-shirt with the Friends of Istokpoga logo. Shirts may be picked up at a General Meeting of FOI, at the Lorida Community Center. Membership rates remain unchanged; Individual rate $7.00 for one year, $21.00 for three years. Family rates; $12.00 for one year, $36.00 for three years. Associate Member rates; $25.00 for one year, $75.00 for three years. Be sure to visit Windy Point Park the next time you are in that area. The county has done a great job on this park. It is located on Boat Ramp Road, just off Highlands Lake Drive on the southwest shore of Lake Istokpoga. There will be a very important presentation regarding the Minimum Flows and Levels (MFL) by the South Florida Water Management District (SFWMD) on Thursday, May 26, 2005, 3:30 PM, at the main auditorium of the Ag-Civic Center in Sebring, Florida. We encourage you to come out for this meeting as the results of this could have serious impacts on the future of Lake Istokpoga. Copies of the report are expected to be available. The annual meeting of the Friends of Istokpoga Lake Association, Inc. was held last night. The results of the election was that Gary Albin, Bill Dwinell, Bert Galloway, Don Linton, Jeanne Porter, Jack Richie, and Jim Wilburn were elected as directors. A meeting of these directors was held immediately following the general meeting to elect the officers. Bert Galloway was elected as President, Don Linton was elected Vice-president, and Jeanne Porter was elected for her second term as Secretary/Treasurer. The ground breaking ceremony was held this afternoon at the Windy Point. The county will begin work on expanding the boat ramp from a single, narrow, one-boat ramp to two ramps wide enough to launch four boats at one time when completed. Additionally, there will be restrooms, expanded parking and a fishing pond for the children. This year's treatment for hydrilla began on February 8th. The treatment this year is being done using the liquid form of the herbicide Florodone. DEP believes this will prevent the microbes in the soil from eating the herbicide before it can kill the hydrilla. Concentrations will be monitored and re-treatments will be applied if the levels drop too low to kill the hydrilla. For more information on this years treatment, come to our annual meeting on February 24th. The Florida Fish and Wildlife Conservation Commission (FWC) will be spraying aquatic weeds in Lake Istokpoga beginning October 26, 2004 and ending October 29, 2004 using helicopters to release the herbicides. They will be spraying for pickerelweed, water primrose, and burhead sedge. Herbicides used will be glyphosate (Aquastar) and 2,4-D. The Highlands County Parks and Recreation Department has recently received another grant for the work planned for Windy Point, currently a boat ramp on the southwest shore of Lake Istokpoga. To date they have $460,000 toward the improvements. Among the improvements slated for the park is widening of the boat ramp and additional parking. The Parks and Recreation Department hopes the work will be completed by mid 2005. Our annual corporate meeting was held last Thursday night. The Directors for 2004 were elected by the members present. Bill Dwinell, Jim Wilkins, Jeanne Porter, Jack Richie, Don Linton, Bert Galloway and Ray Schirtz were elected. Following the Annual meeting a Board of Directors meeting was held and an election of officers was held. The officers for 2004 are: President - Bill Dwinell, Vice-president - Bert Galloway, Treasurer - Jack Richie, Secretary - Jeanne Porter. February 2, 2004 the full lake treatment for hydrilla will begin on Lake Istokpoga. They will treat the lake one time (2400 acres in 50 acre plots) and then monitor the hydrilla to see how effective the treatment is doing. If the hydrilla is not being killed at the expected rates additional treatments will be done. The lake will be sampled every two weeks after the initial treatment. It will take 45 to 60 days before the hydrilla starts to die. Many addresses in Highlands County will be changing soon to get in compliance with the 911 requirements. Notices will be mailed next week to all county residents that will be effected by these changes. We ask that all our members that are having their address changed notify us as soon as possible so that you will not miss a single edition of the Istokpoga Newswire. While we have still not seen a plan for Istokpoga canal from the USACE or SFWMD, we have heard from representatives from the US Fish and Wildlife Service that plans to dredge the canal have been dropped because of issues raised by the USFWS and others, including Friends of Istokpoga Lake Association, Inc. The Friends of Istokpoga Lake Association, Inc. wrote a letter in opposition to the proposed plan when we first heard it. We have not received any response directly from USACE, we have gotten verbal assurances that they no longer plan to dredge the canal. We do still have concerns that SFWMD and the USACE want to allocate water from Lake Istokpoga to the newly restored Kissimmee River (note that the restoration is only partially complete). We believe that this could be a major problem for Lake Istokpoga depending upon the timing of the withdrawals. We will stay on top of this problem and let you know as it progresses. Dues notices were mailed to all members and Associate Members who have not already paid their dues for 2004. If you haven't already mailed your dues, do so now so you will not miss a single issue of the Istokpoga Newswire. Please include your name and address and $7.00 for an Individual Membership or $12.00 for a Family Membership. Associate Member dues are $25.00 and will also expire on 31 December 2003. 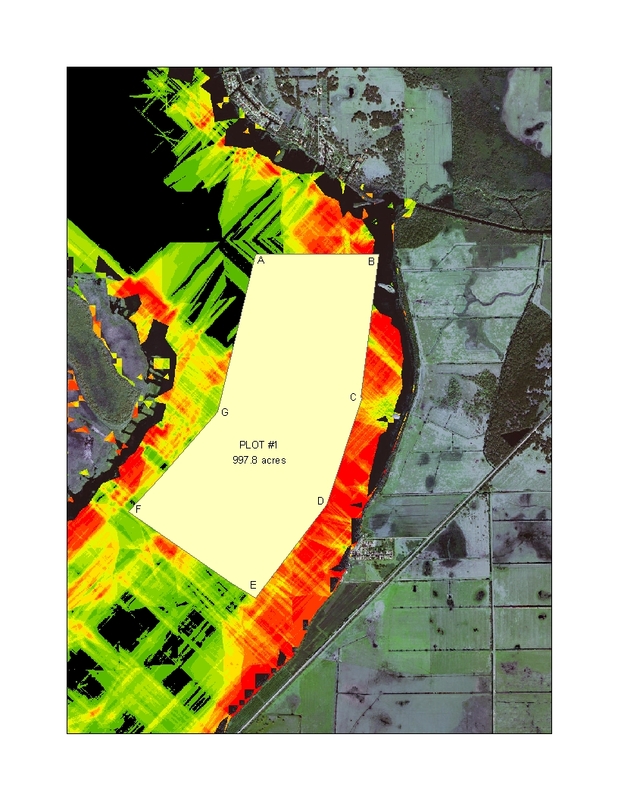 The Florida Fish and Wildlife Conservation Commission's Division of Freshwater Fisheries has selected a total of 1,024 acres of dense vegetation for herbicide treatment as part of the Lake Istokpoga Fish Management Area (FMA) aquatic habitat enhancement program. Areas to be treated by airboat range along the shoreline from Highlands Park Estates to Istokpoga Canal. Areas to be treated by helicopter include Big Island marsh, Bumblebee Island marsh, and Grassy Island, areas within Henderson's Cove, and south of Istokpoga Canal. Depending on weather conditions, the airboat treatment is scheduled to begin on October 6 (Monday) through October 30 (Thursday). The helicopter treatment is scheduled to begin on October 27 (Monday) and continue through October 30 (Thursday). Maps showing treatment areas will be posted at Istokpoga's public boat ramps and local fish camps. Please try to avoid these areas during the spray operations. For additional information, contact Beacham Furse or Larry Davis at (863) 462-5190. "I want to express my concern that Lake Istokpoga be included in the Lake Okeechobee Protection Plan. 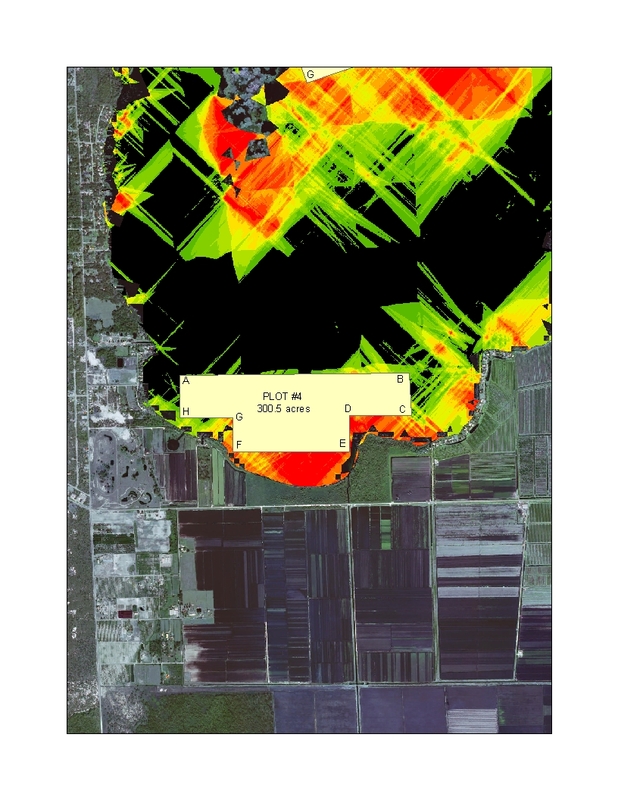 While I understand the scope of the plan may not directly address cleaning up Lake Istokpoga, I feel strongly that the plan not look at Lake Istokpoga as just another place to store phosphorus so it doesn't reach Lake Okeechobee. We do not want Lake Istokpoga to become another Lake Okeechobee with all its phosphorus problems. The ability of Lake Istokpoga to absorb or assimilate the phosphorus is limited, and if the phosphorus entering Lake Istokpoga is not addressed, it will not only harm Lake Istokpoga, but it will also be a significant problem for Lake Okeechobee in the years to come. We don't know if it will be ten years or thirty years, but both lakes will be severely impacted! The plan [LOPP] may achieve the 2015 TMDL goal at the expense of both lakes beyond 2015 if Lake Istokpoga is Ignored." Due to above normal rainfall over the past 30 days in the northern portions of the South Florida Water Management District (SFWMD), water levels in the Kissimmee River have crested over three weirs in the Kissimmee River between water control structures S-65A and S-65C. Barriers to navigation have been placed adjacent to each of these weirs to prevent boaters from attempting to cross over them. Remnant river channels circumventing each of the weirs remain open to navigation, keeping travel between Lake Okeechobee and Lake Kissimmee possible. Additionally, due to the heavy rainfall, a large amount of water from the Kissimmee River continues to flow into Lake Okeechobee. This may cause lowered dissolved oxygen levels in the north and northeast portions of Lake Okeechobee. Florida Fish and Wildlife Conservation Commission and SFWMD scientists are on Lake Okeechobee this week to monitor the situation. Lower dissolved oxygen levels will cause fish to migrate from the area, seeking water with better dissolved oxygen conditions. Weekend fishermen may find that they have to move away from the mouth of the Kissimmee River to find the best fishing spots in Lake Okeechobee until flow conditions from the river into the lake return to normal. Advance notices of changes in navigation will continue to be printed in local newspapers and reported on radio and television broadcasts. Please call either the SFWMD Okeechobee Service Center or the SFWMD Orlando Service Center with questions and for the most current information when making plans to travel the Kissimmee Waterway. The Okeechobee telephone number is (863) 462-5260 or (800) 250-4200. In Orlando, the telephone number is (407) 858-6100 or (800) 250-4250. According to the Lake Istokpoga Regulation Schedule, we are almost through the low water portion of the schedule. In a few days the level of the lake will be allowed to gradually rise, slowly at first and then, around the first of September, a little faster. We should reach full winter pool level early in October. If you would like to see the schedule, click on the "Lake Level Graph" button on this page. According to a note received today from DEP, the permit has not been issued to Wabasso Road Dairy at this time. Here is what DEP said: "The Department is preparing responses and making appropriate revisions to the draft permit based on significant comments received during the public comment period. (62-620.550 and 620.555 Florida Administrative Code) The next step in the process is for the Department to issue a Notice of Intent to issue the permit with a corresponding 14 day petition period pursuant to Chapter 120 Florida Statutes. Issuance of the final permit is the next step and will take place upon resolution of a petition, if any." The Department of Environmental Protection has scheduled a hearing on 23 June 2003, 2:00 PM at the Highlands County Extension Service Auditorium. This hearing is for public comment on a request from the Wabasso Road Dairy to increase their herd size from approximately 1200 cows to 2000 cows. This herd increase will undoubtedly increase the phosphorus deposited by these cows. DEP plans to issue the requested permit unless public comment changes their opinion. The amount of phosphorus runoff from the Wabasso Road Dairy is a critical concern of the Friends of Istokpoga. We urge you to attend this meeting and insist that the phosphors runoff be reduced, not increased. Highlands County instituted a tourist tax in 2003 and has allocated 10% of that tax to benefit the lakes in Highlands County with public access. The funds will be managed by Highlands County. Decisions on where to spend the funds will be made by the Highlands County Board of County Commissioners. The Highlands County Lakes Association (HCLA) will make recommendations for project funding to the Tourist Development Council (TDC). The TDC will then take the recommendations to the County Commissioners for approval. The process for determining which projects the HCLA will recommend has not been worked out at this time, but it is expected that the HCLA Board of Directors will form a committee to handle the screening of the projects submitted by individual lake associations. It was estimated that approximately $38,000 would be available by the end of next year (September 2004). While this may sound like a lot of money to some, it is a pretty small amount when you consider there are approximately 40 lakes in Highlands County that would be eligible for the funds. Add to that the expense of most lake related projects and the amount seems even smaller. The committee will have their hands full in selecting the best projects to obtain this funding. Very soon the Florida Senate and House of Representatives will vote on budget changes that could be devastating to Florida lakes. The current situation is that the Senate proposed continuation of the funding levels currently in place, but the House has proposed cutting the funding for Invasive Plant Control by $20,000,000.00. Not only will this be devastating to Florida water resources, but it will negate the monies already spent cleaning up our waters by letting them revert back to an uncontrolled mass of aquatic plants. For Lake Istokpoga this could be devastating. Within a few short years navigation and fishing could be seriously impacted. We urge you to contact your state senators and compliment them on the fine work they have done and encourage them to stand fast on their positions. Also, you must contact your representatives in the House and let them know you oppose the planned funding cut for Invasive Plant Control. For contact information please see our Government Contacts page. According to Vicki Pontius, Parks and Recreation Director for Highlands County, a full lake treatment is being done, not just the south end, as was reported in a local newspaper. This year the work is in 3 treatments, March 11, March 17, and March 31. There will be less labor involved since some of the herbicide is coming in 1000-pound bags rather than 40# buckets. A total of 2400 acres will be treated, which means that 24,000 acres of the lake is effectively treated. There is also a change in the herbicide being used. In addition to the Sonar SRP, we will be using some Sonar PR this year. This is a rapid-release formulation of Sonar, which will distribute faster than the Sonar SRP, a slow release pellet. The grab samples, or test plots, will begin about one month following the treatments, giving the herbicide time to release into the water and start doing its job. Hydrilla treatment is scheduled to begin 11 March 2003. As in the past, helicopters will be used to disperse the herbicide. We will post more information regarding the scope of the treatment, and the actual dates of other treatments as soon as we get them. The water level regulation schedule in effect for Lake Istokpoga calls for the SFWMD to begin lowering the lake level on 1 April of each year. The lake level is scheduled to reach the normal summer pool level by 1 June, where it will remain until early August when the lake will be allowed to refill. The lake should be back to full level by mid October. The regulation schedule calls for the summer pool level to be between 38.25 ft msl and 37.5 ft msl. Down stream water supply requirements determine the actual level of the lake at any given time during this period. SFWMD is the agency that decides when water releases are required as long as the lake level remains within the level cited above. Any variance outside of this range requires approval of the U.S. Army Corps of Engineers. Boat owners keeping their boats in shallow canals should take note of the dates and move their boats out of these canals before they become too shallow. Our annual corporate meeting was held last night. The Directors for 2003 were elected by the members present. Bill Dwinell, Jim Wilkins, Jeanne Porter, Jack Richie, Don Linton, Tom Watson and Bert Galloway were elected. Following the Annual meeting a Board of Directors meeting was held and an election of officers was held. The officers for 2003 are: President - Bill Dwinell, Vice-president - Jim Wilkins, Treasurer - Jack Richie, Secretary - Jeanne Porter. Dr. Brunty will speak at the Friends of Istokpoga Lake Association meeting on 20 February 2003. She will discuss "Algae and the Lake User". Everyone using the lake or living around it will benefit from the information Jennifer will give us. See our Events page for more information. "We have been working day and night patrols on Lake Istokpoga, targeting persons taking over the limit of speckled perch. We have made 17 arrests for taking over the bag limit, seizing over 1100 fish as evidence that were photographed and donated to charity. We have written a number of boating violations and fishing license infractions related to these patrols. We have also had several details specifically targeting persons fishing at the CR 621 spillway, looking for cast net violations. No cast net arrests yet but we have made numerous license arrests there." The harvester is back at work on the northwest point cleaning up tussock they couldn't get when the lake was drawn down. It started work this week and will work until the FWC runs out of money for this project. Currently, $88,000 is allocated for this project, but, according to Beacham Furse, FWC Project Manager, he is still trying to get more funding for this project. For now we can expect the harvester to work for about a month. The SFWMD is conducting a study of the streams, creeks and other water sources north of Lake Istokpoga to determine the point sources of phosphorus (P) entering into Lake Istokpoga. The sampling was done in both the dry season and the wet season. Paul Ritter, SFWMD, Clell Ford and Jennifer Brunty, Soil and Water Conservation District, took the samples earlier this year. Paul is now compiling the results, which are expected to be released soon. This study was established due to increasing levels of P in Lake Istokpoga. There is also a companion study of the in-lake P being conducted. This study is looking at the sediments within the lake. Greg White, SFWMD, is in charge of this study, being conducted by the University of Florida. There is also a mathematical modeling study being developed of the P in the Upper Chain of Lakes and Lake Istokpoga. These last two studies are expected to complete in mid 2003. They are being conducted as part of the Lake Okeechobee Watershed Project. Florida Fish and Wildlife Conservation Commission (FWC) has completed the spraying of slightly over 1000 acres of weeds along the shoreline of Lake Istokpoga and the north side of Big Island. They were spraying for a variety of invasive plants, such as cattail, pickerelweed, burhead sedge, water hyacinth, water lettuce, and water primrose. This spraying is a part of the FFWCC's continuing battle with the growth of tussock on the lake. Keeping the weeds under control will slow the re-growth of the tussock on the shoreline that was cleared during the drawdown in 2001. 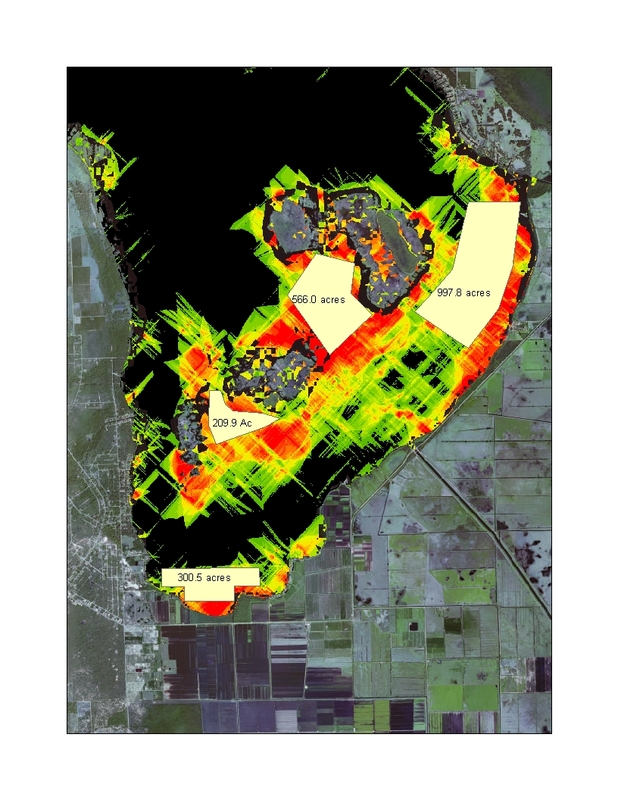 As part of the Everglades Restoration Project, the U.S. Army Corps of Engineers (USACE) and the South Florida Water Management District (SFWMD) have started work on analyzing and re-looking at the regulation schedule currently in effect for Lake Istokpoga. It will probably take several years to complete this project. The first meeting was held on October 2, 2002. The next meeting is currently planned for October 29, 2002. Our concern is that they keep the health of Lake Istokpoga as the primary objective. We will be there to help with this. Bert Galloway has been appointed to fill the open Director position. We welcome Bert to our Board of Directors and we thank him for volunteering to serve our Lake Association in this capacity. According to an article on April 25, 2002, in the Highlands Today Newspaper, Lake Istokpoga has been named as one of the Top 10 Bass Lakes in Florida by the Florida Fish and Wildlife Conservation Commission biologists. Lake Istokpoga also made the Top 10 for crappie and the Top 10 for Pan fishing. Our next newsletter will have the story about the purchase of the Silver Harbor Ranch by the State of Florida. If you are not a member, it isn't too late to join before we mail this issue. Just go to our membership page for more information. The election of officers took place at our regular monthly Board of Directors meeting as prescribed by our by-laws. The results of that election was that Bill Dwinell was reelected as President, Chris Monroe was reelected as Vice-president. Jeanne Porter was elected as Secretary and Chris Monroe was elected Treasurer. The annual election of directors was held on February 21 at our Annual Corporate Meeting. All of the 2001 directors, including those that were appointed to fill vacant positions, were re-elected to serve in 2002. The election of officers will be held at the March Board of Directors meeting. Please see our Officers Page for a list of our directors. According to Jimmy Conner, FWC, the state has closed on the purchase of the Royce Property, also know as the Silver Harbor Ranch. According to Tom Champeau, FWC, the state purchased 2347 acres. The FWC has not announced what their plans are for this property, but did state the land was being added to the Lake Wales Ridge Wildlife and Environmental Area. Two South Florida Water Management District (SFWMD) water control structures south of Lake Istokpoga in Highlands County are scheduled for required maintenance during the next month. This maintenance will require the structure bays to be drained of water, which will cause temporary inconveniences to landowners and travelers in the area. The first structure scheduled for maintenance is the S-83 water control structure located on the C-41A canal. This water control structure, which is primarily used to deliver agricultural water supply, will be out of operation for approximately two weeks beginning on Tuesday, January 22. Contractors employed by the SFWMD will use a crane to place needle beams within the structure bay before the water is drained from the bay. Once it is dry, the inside of the bay will be sandblasted and then new concrete will be applied to ensure the continued integrity of the structure. This maintenance will temporarily interrupt water supply deliveries in the C-41A canal downstream of the structure. Landowners in the area were consulted concerning the timing of this maintenance. Similar work will be performed on each of the three bays at the S-68 water control structure at the south end of Lake Istokpoga, following completion of the maintenance at S-83. Only one of the bays will be taken out of service at a time, so there will be no impact on water supply deliveries or on flood control for residents in the area of Lake Istokpoga. However, the crane that places the needle beams in the structure bay so that it can be drained, will have to temporarily block traffic on CR 621 while that work is being performed. No estimate of the length of time that road traffic will be interrupted is available at this time. A second press release will be issued when the exact date and length of traffic interruptions is known. The SFWMD regrets any inconveniences this necessary maintenance may cause and thanks residents in advance for their patience with these required services. For more information, please contact the SFWMD Okeechobee Service Center at (863) 462-5260 or (800) 250-4200. The office is open from 8 a.m. to 5 p.m. weekdays, but please feel free to leave a voice mail message over the weekend and we will return your call as quickly as possible. The Noise Advisory Committee appears to have reached agreement on a noise ordinance. This proposed ordinance will be presented to the Highlands County Commissioners at an upcoming public hearing. No Airboat, except under idle conditions, shall come within 1,000 feet of any lakeside residence, at any time. In accordance with state law, no airboat may exceed the sound level of 90 decibels at a distance of 50 feet from their craft. No person in an airboat may shine a light at any residence or into any window of any residence. The proposal does not have any restrictions on when a boat, of any kind, may operate. It does require airboats to have baffled mufflers, according to an article in the News-Sun. With the rejection of the $500,000 offer from the county the purchase of Winding Waters is dead. Or is it? The County has another option, Eminent Domain. There is a possibility that the county could use this option to purchase the property in spite of the owners wanting a higher price. Under this option the county would pay a price that is considered fair. One suggestion would be 10% above the last two appraisals, which were $305,000 and $450,000. We do not know if the county will use this option or not. According to Bob Bullard, "I am reluctant to use this option to take property from an owner except where we really have to do it, like building roads." While we would like to see the county purchase this property, we agree with Bob, this is not a case that justifies the use of this option. The owners of the 152 acre Winding Waters property have rejected the offer of $500,000 made by Highlands County. They also withdrew the 60-day extension since the county decided not to do another appraisal. The big loss is to the residents of the county and Lake Istokpoga. Since the property is zoned for a RV and Trailer Park, all we can do is hope it doesn't sell for that purpose. The highlands County Board of County Commissioners decided not to spend over $9000 for another appraisal, as previously reported. There is still considerable disagreement among the commissioners. They did finally agree to offer $500,000 for the property. We can only hope the property owners will agree to this offer. The purchase of the Winding Waters property was before the Highlands County Board of County Commissioners yesterday. The property is 151 acres located in the northeast corner of the lake, adjacent to the Istokpoga Park property. The hopes are that the county can purchase this property and extend Istokpoga Park. The issue is that the property history and current appraisal create a lot of questions about the value of the property. Appraisals have been as low as $315,000 and as high as $1,700,000, with $450,000 being the latest. It appears that comparing the appraisals was like comparing apples and oranges. It was unclear of the parameters under which the appraisals were done. The sales prices are just as varied. It has sold as sold for $1,500,000, $227,000, $980,000, $500,000 and most recently for $225,000. The property was offered to the county for $750,000. The current appraisal of $450,000 is a problem for at least two of the county commissioners, in spite of a conservative mitigation value of $200,000 according to Carl Cool, County Administrator, and his staff. To pass the commission will have to vote at least 4-1 in favor of the purchase. Bob Bullard, County Commissioner, made a motion, seconded by Edgar Stokes, to conduct another appraisal to determine the value of the property to the residents of Highlands County. The motion passed 5-0. This kept the issue alive for the moment. The concern now is if the seller will extend his offer another 60 days to allow time for the appraisal to be completed. This property could be a real asset to the county and it would be a significant loss if this property were developed, especially if it is developed as it is currently zone, It is currently zoned CG3. This will allow a developer to put in a campground and sell individual camping sites. We cannot afford to let this happen. With ? mile of lake shoreline and 1 ? miles of shoreline on Arbuckle Creek, this could be an ecological disaster for Lake Istokpoga. We are officially at winter pool level of 39.5 ft. NGVD. The lake actually reached this level a week or so ago, but it was actually higher than it was suppose to be then. The lake was at 39.48 this morning with the gates open 2.0 feet, all three of them. While we have been able to keep our dues at the unbelievable low rate of only $5.00 up until now, we find we need to increase it slightly to meet our annual financial obligations. Our new rates, effective November 1, 2001, are $7.00 for an individual, $12.00 for our New Family Membership, and $25.00 for our Associate Members. For some of you it will be a slight increase in dues, but for families it actually be cheaper. A Family Membership is intended for a couple and all of their children under 18 years of age on January 1 of the year your dues are applied. Our new rates are still one of the best deals you will find anywhere. Areas cleared during the lake Restoration will receive aerial herbicide treatment of dense cattail, pickerelweed, water primrose, and spatterdock are proposed. Areas of dense pickerelweed and water primrose inside the marshes will be treated to prevent monoculture stands and open up areas to wind and wave action. Dense cattail and spatterdock along the outer edge of the marshes will be treated intermittently to open pathways into the marsh for wind and wave action. Herbicides to be used are glyphosate (EAGRE) at 120 ounces/acre and 2,4-D Liquid (AMINE 4) at 32 ounces/acre. The Florida Fish and Wildlife Conservation Commission's Division of Freshwater Fisheries has selected a total of 1,280 acres of dense vegetation for herbicide treatment as part of the Lake Istokpoga Fish Management Area (FMA) aquatic habitat enhancement program. Depending on weather conditions, spraying is scheduled to begin on October 8 (Monday), continuing through October 12 (Friday). Maps showing treatment areas will be posted at Istokpoga's public boat ramps and at local fish camps. Please try to avoid these areas during the spray operations. For additional information, contact Beacham Furse or Larry Davis at (863) 462-5190. At the Florida Wildlife Federation Annual Banquet held in Indian Rocks Beach, FL., on Saturday, September 8, 2001, Bill Dwinell, President, and Chris Monroe, Vice-president, accepted the award for Conservation Group of the Year. We are very proud to accept this award and the recognition associated with it. The FWF Press release is available on our press page. An algae bloom has been reported around Big Island, Bumblebee Island and areas south of these islands, including the canal to Trails End Fish Camp. The hot weather, intense sun and warm water all contribute to this problem. While this is a fairly normal occurrence for this time of year, nutrients from inflows from Arbuckle Creek and those stirred up by the Lake Restoration work could be factors that need to be looked into. Friends of Istokpoga have asked that this topic be added to the upcoming Lake Istokpoga Management Committee meeting on September 6, 2001. The links to the USACE web site are now working. The web site is back in operation. Many of you like to check the lake level at the USACE web site using the links on this page and on our links page. The site has been down for about two weeks because of a virus or worm attack on their web site. We will let you know here as soon as the site is back on the air. Since the lake reached the normal range, SFWMD is obligated to keep the lake level at specific levels. With all the rain we have received lately, they are forced to release water via the S-68 structure. As of this morning, all three gates were open 2.4 feet. The lake is currently at 38.230 feet. The regulation schedule changes the lake level in the next few days allowing the lake to fill so we should see the releases reduced soon. You can check the water level and how it fits within the regulation schedule by checking the USACE web site graph from our links page. Please note that this link is currently not working because the USACE has closed the site until the latest computer virus problems are resolved. The level of Lake Istokpoga reached 38 feet this morning. This is within the normal range for the lake this time of year (refer to the lake level graph to see the lake level and regulation schedule). This being the case, don't be surprised of SFWMD releases some water from the S-68 structure. The rain has been doing a good job on our lake. This morning it was at 37' 8" and we are having light rain today. The number of boats on the lake is starting to increase. If the rain continues like it has been for the past few weeks, we should get pretty close to the 39' 6" level if SFWMD doesn't let any of it out. Highlands county has completed the work of removing the sandbar that prevented many from enjoying the beautiful ride up the creek. Be sure to take this scenic trip next time you are joy riding the lake. The boat ramps at Istokpoga Park are closed temporarily. Highlands county has began a remodeling project. The boat ramps are being enlarged so four boats can be launched at the same time. They have also deepened the canal. Highlands County officials are in hopes that this will allow some big bass tournaments to be held on Lake Istokpoga. In addition to enlarging the boat ramp, they will be adding a boardwalk to the other side of the canal. For more information refer to the July 2001 issue of the Istokpoga Newswire. The extension of the period where SFWMD would hold the lake to 36.5 feet msl, has expired as of today. The lake will now be allowed to refill to its normal levels. The only thing we need is rain. The good news is that the restoration work is pretty much completed. According to FWC the only work left is clean up work. This is primarily work on the upland storage sites. While sites 1 and 2 have not been officially signed off, we are delighted that the shoreline work has been completed. Be sure to see the next issue of the Istokpoga Newswire for a review of the complete project. In case you aren't aware of it, Highlands county is busy on Lake Istokpoga. They are busy cleaning out the sandbar that has been blocking the mouth to Arbuckle Creek. This is something the Friends of Istokpoga Lake Association has been trying to get done for some time. They are also very busy at Istokpoga Park redoing the boat ramps and the canal. The plan is to deepen the canal, add more boat ramps and install another boardwalk on the north side of the canal (there is already a boardwalk on the south side of the canal). We hope to have pictures of this work available soon. The results of the final samples are posted. 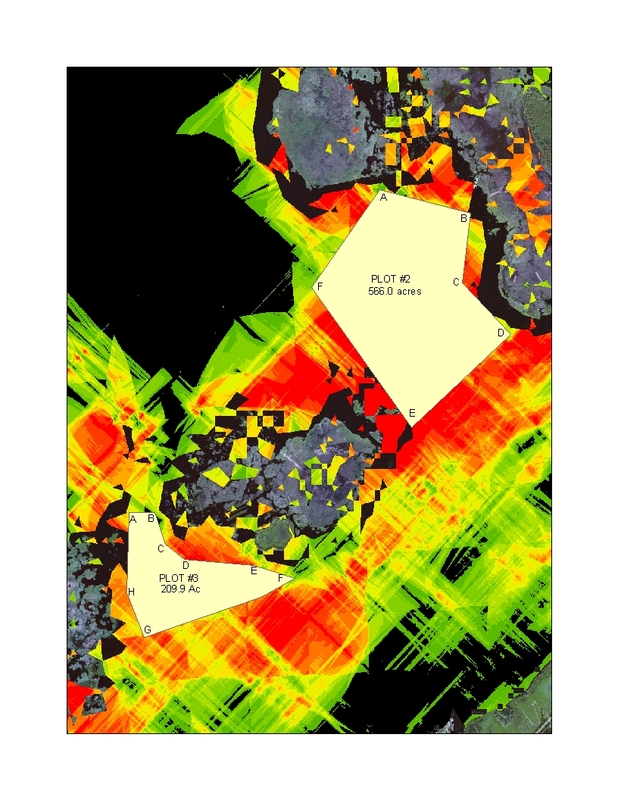 The results for area 7 show a significant increase in the concentration because of the additional application of Sonar in that area. We are still waiting to see what the plans are for area 8, which still has very low concentrations. Areas 7 & 8 on the the FasTEST samplings have not reached the levels of Floridone (Sonar) they were expected to reach by this time. They should have reached 4 to 7 parts per billion and area 7 the better of the two has only reached 3.35 ppb and area 8 is still less than 1.0 ppb, this is far too low to effectively kill hydrilla. Vicki Pontius (Highlands County Parks & Recreation) said the county will treat two 50 acre plots in those areas with Sonar pellets. As it dissolves it should expand its effective area up to ten times. This should take care of areas 7 & 8 and they will also treat some other areas with Aquathol to create navigation paths. The data from the second sample has been posted on our Sample Map. We have also added a graph of the data. We will add the additional sample information when we receive it. The hydrilla treatment has been completed. We are now in the stage where DEP determines the concentration of the herbicide Sonar (floridone) so they can see how well it will work. Since Sonar is in the form of a pellet that dissolves rather slowly, the concentration increases over time. The first sample was taken on March 28. You can see the results by checking out our Sample Map. Samples will be taken every two weeks for 14 weeks. The next sample will be on April 11. Then on 4/25, 5/9, 5/23, 6/6 and finally on 6/20. We will post the results of each of these samplings on our hydrilla treatment map, when we receive them. The final treatment of four, is scheduled for Tuesday, April 3, 2001. The lake wide treatment is the final one this year. Eleven fifty-acre sites will be treated this time. All treatments are applied by helicopter. The water level of Lake Istokpoga rose to over 36' 6" due to the recent rain. In order to keep the shoreline dry enough for the contractors to keep working the lake must stay at or below this level. Because of that, SFWMD opened the gates to release the excess water. At the Restoration Celebration, March 23, 2001, Jeff Schardt, DEP, stated that there would be no treatment for hydrilla this week. Instead they would be taking water sample at various points around the lake to test the concentration of floridone (Sonar) in the water. They are taking samples from a number of different locations. The concentrations they find will determine how much Sonar they need to use in the final treatment, scheduled for April 3, 2001. We will post the results of this sampling and future samplings as soon as we receive them from DEP. The second application of Sonar was applied on Tuesday, March 13, 2001 under windy conditions. The applications are made to specific locations throughout the lake. Each location is target to fifty acres. In shallow areas this is expanded to 62.5 acres to reduce the concentration. You can view the locations treated by checking our our Hydrilla Treatment Map. This map also shows the areas where hydrilla is growing. We also have some pictures near the S-68 structure where they loaded the helicopter for the treatments. We added a new topographical map to the Istokpoga Page. Soon we will have a map of the locations of the 50 acre plots where the Sonar is being applied. We also added some new pictures to the Picture Page. There are new pictures in both automatic boxes, so take a few minutes to check these out. According to Kim O'Dell, SFWMD, 99% of the water released to bring the lake down to the 36.5 foot level required by Florida Fish and Wildlife Conservation Commission to be able to remove the tussock, was retained within the Istokpoga Basin. The remaining 1% was released into Lake Okeechobee. This was accomplished by the permitted water users in the basin and SFWMD storing the water in canals and blocking the gates where the water would be released. According to Clell Ford, Highlands County Lakes Manager, there were 17,811 acre/feet, which is over 5,800,000,000 gallons, released from Lake Istokpoga. It is good to know the water didn't go to waste. Last night we held our Annual Meeting required for the election of officers. I am pleased to announce that all of our Directors and officers were unanimously reelected. Dr. Paul Gray also presented a comparison of Lake Istokpoga and Lake Okeechobee. The complete story will be in our next issue of the Istokpoga Newswire to be published in March. We also had Carl Smith give us an update on the plans for the full lake hydrilla treatment planned to start on March 6, 2001. The draw down of the lake to get it to 36.5 feet has begun. SFWMD received permission from the U.S. Army Corps of Engineers yesterday to begin releasing the water from Lake Istokpoga. In order to minimize the quantity of water released in a single day, SFWMD began releasing the water immediately. For the complete schedule for the drawdown and tussock removal see our Drawdown Page. While we haven't been able to get an exact date when the water releases will begin to lower the lake for the tussock removal project, consensus seems to be that they will begin around February 5, 2001. If this happens on this date the lake will drop a little less than an inch each day until the lake level reaches 36.5 feet. If it starts later than February 5th the daily drop in level could be greater. The objective is to have the lake at 36.5 feet by mid February. The latest word from FWC is that the bids are out and it is looking like the drawdown will start soon. They cannot give us a date yet, but expect the water to start dropping sometime in the next few weeks. We will post the schedule here as soon as we know it, but be warned that there might not be much advanced notice. If you plan to take your boat out of the lake before the water drops too low, you need to pay close attention to the S-68 structure. The lake will drop over a foot from its current level of 37.61 ft. msl. to 36.5 ft. Many of the canals that are already low will become impassable when the lake drops this much. One other word of caution. The lake will continue to drop until the rainy season starts in mid June. Expectations are that it could drop another foot by then. So when you consider leaving your boat in the lake, remember that it could be two feet lower than it is now. Be sure to check the Drawdown page for more information on the drawdown. We are happy to report that SFWMD has made repairs to the G-85 structure and according to their spokesperson, there are no more leaks. Count one up for Friends of Istokpoga! If we had not pushed to have this structure repaired, our lake would still be in peril. We have been assured that G-85 will last until the new structure is completed by the U. S. Army Corps of Engineers (USACE) in a few years. Click here for the complete story about G-85. On December 20, December 30, and January 1, SFWMD released water from Lake Istokpoga even though the lake is well below the level where they are allowed to release water for water supply reasons. The reason given for the releases was for the downstream citrus farms for freeze protection. According to SFWMD representatives, it was released under authority of the U.S. Army Corps of Engineers "Master Water Control Manual for Kissimmee River - Lake Istokpoga Basin" Section 7-12 a (Emergencies). The South Florida Water Management District (SFWMD) has declared a water shortage Within the Indian Prairie water use basin. This is the area southeast of Lake Istokpoga and includes Lake Istokpoga. We are entering our dry season; the lake is below the regulated minimum level already. Since Lake Istokpoga is dependent upon rainfall to refill, it is likely we will continue to see the water level drop. Lake Istokpoga is the sole source of surface water for the Istokpoga/Indian Prairie Basin. With the lake below the minimum level, SFWMD is not allowed to release water from Lake Istokpoga. The Brighton Indian Reservation, which comprises the lower portion of this basin does have access to additional water using the pumps at R-207 and R-208, to back pump water from Lake Okeechobee. The upper potion of the basin is completely dependent upon Lake Istokpoga, although many of the permitted users have wells to supplement their water needs. At the present time, SFWMD is asking everyone in this area to voluntarily conserve water. Want to help? Set your sprinklers to water only one day a week. Don't wash your car or boats. Conserving water is everyone's responsibility. You can do your part to help Lake Istokpoga!! A full-lake Hydrilla treatment is planned for this winter. DEP will spend a little more than $1.8 Million to treat 2600 Acres of Lake Istokpoga this winter. An exact start date has not been set yet, but it will likely be between January 2 and March 31, 2001. The Highlands County Water Advisory Board (WAC) made recommendations regarding the SFWMD Contingency Plan to the Highlands County Board of Commissioners on October 2, 2000. The issues included the request for installation of pumps at S-83 and S-84, to recommend the WMD allocate water under drought conditions based on need, not permitted quantities, express concern to SFWMD that Highlands County was not asked to participate in the development of the contingency plan, and that the G-85 structure be repaired. Additionally, the WAC pointed out that Highlands County needed to be more involved with the Water Management Districts and should have someone on staff that attends all of the SFWMD and SWFWMD meetings. The county commissioners approved all of the recommendations! Florida Fish and Wildlife Conservation Commission (FWC) have purchased ~38 acres near the Windy Point boat ramp. Their hopes are to create a park there that would provide parking for about 150 cars and boat trailers. Details of the park plans have not been worked out at this time. We will post updates to the plans when they become available. The FWC also announced the purchase of two lots at the Cowhouse Road boat ramp that will allow them to add more parking in this area. Highlands County Commissioners approved the purchase of two lots at the end of Rutledge Avenue in Highlands Park Estates. The lots are next to the public boat ramp at the end of Rutledge and are to be used as parking lot for the existing boat ramp. According to the Lake Placid Journal on July 27, 2000, Carl Cool, County Administrator, said the lots are useable when the water is low [after they are cleared], like it is now, but fill will have to be brought in to be able to use the parking lot year-round. Also, according to Carl Cool, the lots are considered jurisdictional wetlands. The county will pay $25,000 for the two lots that the property appraiser valued at $17,250. and burhead sedge around Big Island and Bumblebee Island starting next Wednesday (June 7) through Friday (June 9), weather permitting. The plan is to treat the dense cattail and burhead sedge inside the marshes to open up areas for wind and wave action, as well as, the dense cattail along the outer edge of the marshes intermittently to open pathways into the marsh for wind and wave action. The herbicides to be used are glyphosate (AQUANEAT/RODEO) and 2,4-D Liquid (WEEDAR 64), the same chemicals most people use in their yards to treat weeds. If you have any questions, call Beacham Furse or Larry Davis at (863)462-5190. The proposed drawdown by Florida Game and Fresh Water Fish Commission is still on hold awaiting funding. The best guess on when it will happen is 2002 or 2003. We will keep you apprised of any plan changes here and in the Istokpoga Newswire, our newsletter. Highlands County has applied to the state for $3.1 million, half of what will be required. While the funding request has not been approved, it has made it past the first hurdles. The Fish and Wildlife Conservation Commission have raised $1 million and hopes are high that the US Army Corps Of Engineers will come up with the remaining $2.1 million. The slot limit proposal by Fish and Wildlife Conservation Commission (FWC), formerly the Florida Game and Fish Commission (GFC), was implemented on Lake Istokpoga on July 1, 2000. Under the Protective Slot Limit all bass caught between 15" and 24" must be released immediately. Only three bass may be kept either above or below these limits, of which only one may be over 24". For more information visit the FWC Slot Limit Web page. South Florida Water Management District (SFWMD) Begins releasing water Early this year. USACE regulation schedule calls for the water level of Lake Istokpoga to drop from a high of 39.5 ft. to 38.25 ft. beginning in Early April. The stated purpose of the scheduled release is be ready for hurricane season. SFWMD started the releases in early March because of "downstream water demands from permitted users". This will potentially do significant harm to the bass spawn since the bass spawn in very shallow water, and will likely leave their nest as the water level drops. Friends of Istokpoga, after two attempts, was able to convince SFWMD to stop the early releases. They were able to meet the downstream demands by back pumping into the canals from Lake Okeechobee. Our thanks to SFWMD for hearing our plea. Early in April the normal releases began. According to Beacham Furse, early indications are that the bass spawn is a good one. Bottom line, we believe stopping the releases in March made a significant difference in this year's bass spawn.